Austrian financier; born at Vienna 1753; died at Hietzing, near Vienna, Aug. 7, 1839. 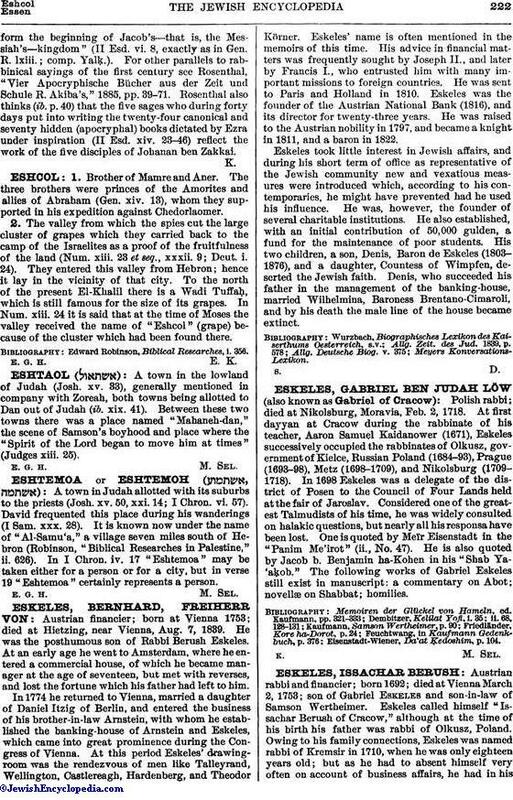 He was the posthumous son of Rabbi Berush Eskeles. At an early age he went to Amsterdam, where he entered a commercial house, of which he became manager at the age of seventeen, but met with reverses, and lost the fortune which his father had left to him. In 1774 he returned to Vienna, married a daughter of Daniel Itzig of Berlin, and entered the business of his brother-in-law Arnstein, with whom he established the banking-house of Arnstein and Eskeles, which came into great prominence during the Congress of Vienna. At this period Eskeles' drawing-room was the rendezvous of men like Talleyrand, Wellington, Castlereagh, Hardenberg, and Theodor Körner. Eskeles' name is often mentioned in the memoirs of this time. His advice in financial matters was frequently sought by Joseph II., and later by Francis I., who entrusted him with many important missions to foreign countries. He was sent to Paris and Holland in 1810. Eskeles was the founder of the Austrian National Bank (1816), and its director for twenty-three years. He was raised to the Austrian nobility in 1797, and became a knight. in 1811, and a baron in 1822. Eskeles took little interest in Jewish affairs, and during his short term of office as representative of the Jewish community new and vexatious measures were introduced which, according to his contemporaries, he might have prevented had he used his influence. He was, however, the founder of several charitable institutions. He also established, with an initial contribution of 50,000 gulden, a fund for the maintenance of poor students. His two children, a son, Denis, Baron de Eskeles (1803-1876), and a daughter, Countess of Wimpfen, deserted the Jewish faith. Denis, who succeeded his father in the management of the banking-house, married Wilhelmina, Baroness Brentano-Cimaroli, and by his death the male line of the house became extinct.